Spring has sprung and now is the time to tackle all the home improvement projects you have been thinking about all winter! The Cleveland Convention Center is hosting the Cleveland Home and Remodeling Expo, March 27-29, chock full of exhibitors and celebrities from HGTV and BravoTV. 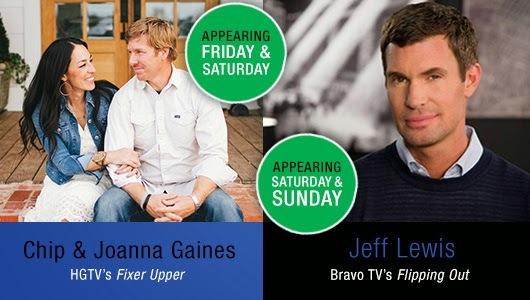 Even if you don't have a house, Chip and Joanna Gaines from HGTV's Fixer Upper and Jeff Lewis from Bravo Tv's Flipping Out will make you want one. There is something for everyone, from the Arcadia GlassHouse Butterfly Feature to fully constructed Vignettes featuring decorating tips for small space living. You can purchase tickets for $10 at the door, but why would you when you can save $2 buying them online and an extra buck using promo code PIEROGI15HR. Now for the fun part. Want to win a pair of tickets? It is super easy, so make sure you follow directions. I let a computer pick the winner, so make sure you come back and comment on this post after you complete each task. 1. What home improvement are you thinking about tackling this Spring? 2. Follow Cleveland Home and Remodeling Expo on Twitter and Facebook. 3. Follow Cleveland Home and Remodeling Expo on Pinterest. 4. Follow Cleveland Chick on the Twitter and Instagram. 5. Tweet the following: " I want @ClevelandChick to send me to the @GreatBigShow! http://bit.ly/1HO5Sny"
Leave a comment for each task. I let a computer pick the winner, so if it isn't there, boo for you. Winner will be selected at 4 pm on Friday, March 27, so get tweeting! Disclosure: I was given a pair of tickets for me and a pair to give away, which is super awesome. Words are all my own, and are fueled by the wonky blogger settings at the moment. I follow Cleveland Home and Remodeling Expo on Twitter and Facebook. I follow Cleveland Home and Remodeling Expo on Pinterest. I follow Cleveland Chick on the Twitter and Instagram. We want to build a kitchen island! I want to spruce up our bathroom. Congratulations to the winner, Kayla!